Our ship was an older, wooden vessel with a carrying capacity of 100 passengers. 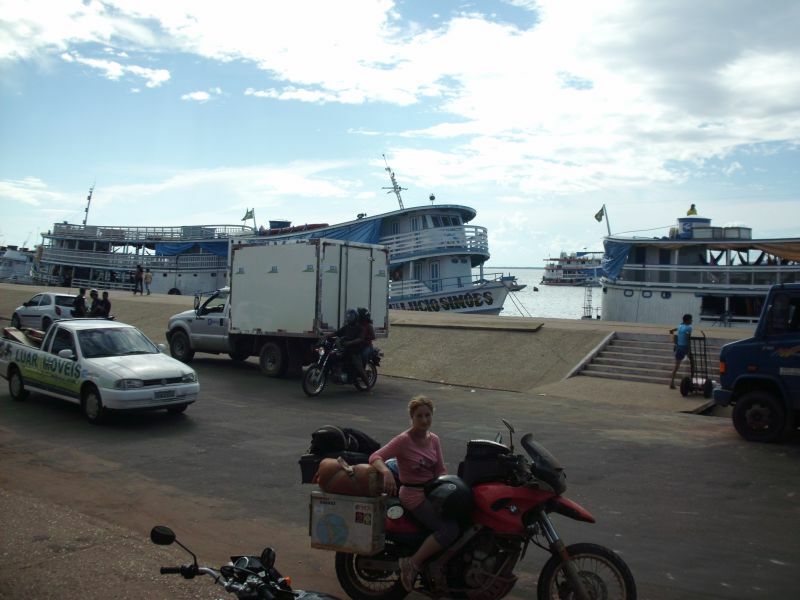 But only about 30 passengers were aboard, so the lower deck was filled with cargo and our motorcycle. Tickets were R$60 per person (food included) and R$150 for Palomina. The trip lasted for about 35 hours. During this time, we stopped in two ports. In addition to this, sometimes smaller vessels were approaching our ship to load and unload passengers and such freight as onions, fish, lemons, ice cream cones etc without having to stop. Two passengers were traveling in cabins while the rest (including us) were accommodated on the upper deck. Everyone had a hammock to sleep but not us, so we rented a pair for R$10. In order to get to Santarem we had to go 900km through the jungle on unpaved road. The surface was sometimes well compacted and even but other times very rough so I decided to lower the tire pressure to absorb that. Bad idea: the tire got punctured. Twice. Each time we had to stop to fix it so we lost a lot of time with that and, by the end of the first day, we had only completed 170km. The next day we began riding with higher tire pressure and the rear shock adjusted to the softest setting. Even so, the shaking was hard enough to break the rear rack and we almost lost our Pelican topcase. So we stopped in a village to get it welded and reinforced with two extra bars. With this stop, by the end of day two we had completed another 270km. Day 3 was even better, as we were able to complete almost 300km. Dust was everywhere, so by the end of the day we were dirtier than ever! The last day was the shortest, as only 200km were left and we reached Santarem just in time to catch the ship. Finally, after riding for four days through the Amazonian forest, we made it to Santarem. But in the meantime an old friend, who read about our plans on this blog, advised me to fly from French Guiana to Paris. I did some research and indeed, even though it’s a bit more expensive than flying from Martinique, it’s more facile: coordinating travel from Venezuela to Martinique and from there to Paris and then further to Romania would have been a logistical nightmare. So in less than two hours we will be embarking for a two days journey towards Macapa instead of Manaus. Will get back with some photos from the jungle then. A fire on the side of the road. The traffic was undisturbed. We spent the night with a local family. After meeting a family member during a short break, we drank a few beers and got invited to sleep and eat for free at his home. In Brasilia we encountered more friendly people: Joe and Eladio. They invited us to stay at their houses, fed us and also wanted to fill our tank, too bad it was already full. In the first picture you can see us and two of them. 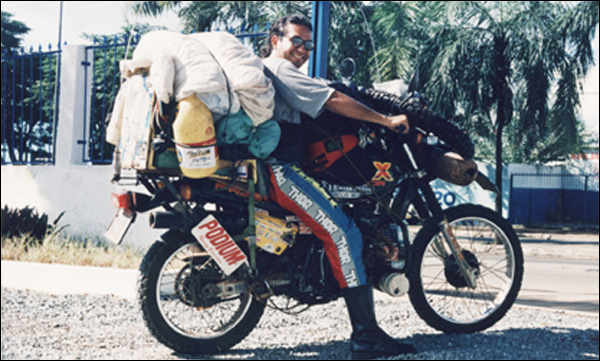 Then, in the second picture, you can see Eladio ten years ago, when he went on a eight months motorcycle adventure from Brazil to Tierra del Fuego, to Alaska and finally to Miami (where he had to stop because his 250cc bike got stolen). 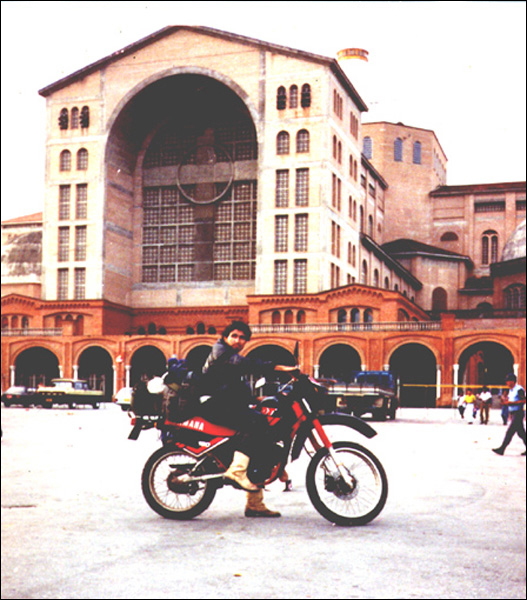 Third picture shows him twenty years ago, during his first trip through Brazil only, an adventure that lasted for two years! In the last picture there are more bikers that we encountered in a village, en route to Cuiaba. They were there to attend a party and invited us to join.